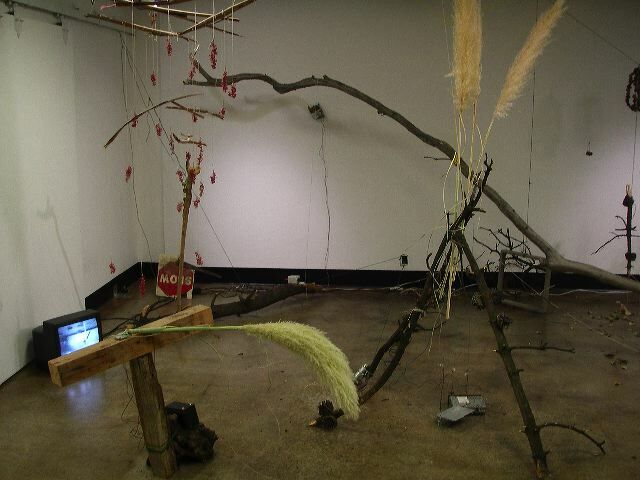 In the Fall of 2007 I was invited to do an artist residency at the Center for Integrated Media at the California Institute for the Arts (CalArts). While there I also gave an "Introduction to Robotic Art" workshop at Machine Project in LA. 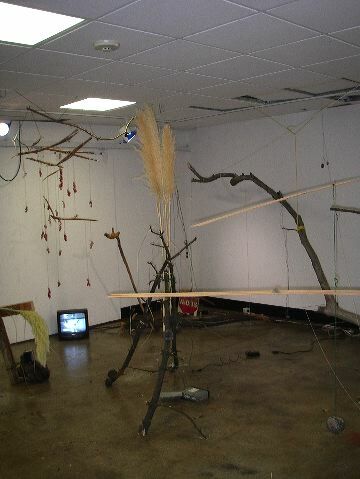 Over the course of a week the IM students and I worked together to build a collaborative kinetic sculpture made almost entirely from found organic materials (branches, seeds, flowers) and salvaged techo-junk (printers, motors, wire, lights). There were also several video monitors and projectors hooked up to hand-held cameras that visitors could use display different parts of the installation. At the end of the week we did a collaborative live streaming video performance with LoVid in New York. Video from the hand-held cameras in the installation space was streamed over the net to LoVid's homemade video processor that was set up at the free103point9 project space in Brooklyn. LoVid processed the video and streamed it back to us for projection into the installation space. Visitors could wander around the space, grab a camera and send some video, talk to the participants in LA or New York, eat some snacks, and so on. It was a casual, friendly way to end a terrific week of collaborative experimentation and creative reuse. Thanks to Tom Leeser, Stephanie Kern, Laura Steenberge, Edwina Portocarrero, Liz Glyn, Dustin Thompson, Mark Allen, the Integrated Media community, LoVid, and free103point9 for their kindness, generosity, and creativity.